January 31, 1925 - December 21, 2015. The plaque be seen here. 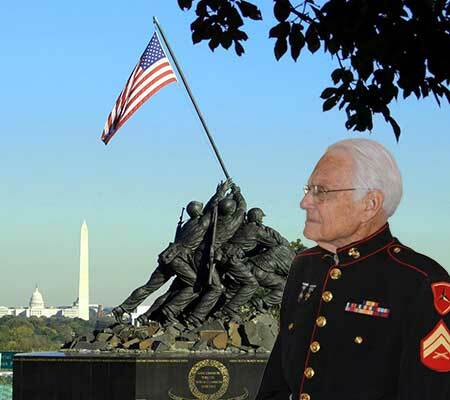 The Iwo Jima Survivors Association Piedmont Triad Foundation was formed in 1995 with the purpose of keeping alive the memory and sacrifice of all military personnel involved in the battle for Iwo Jima Island during World War II. 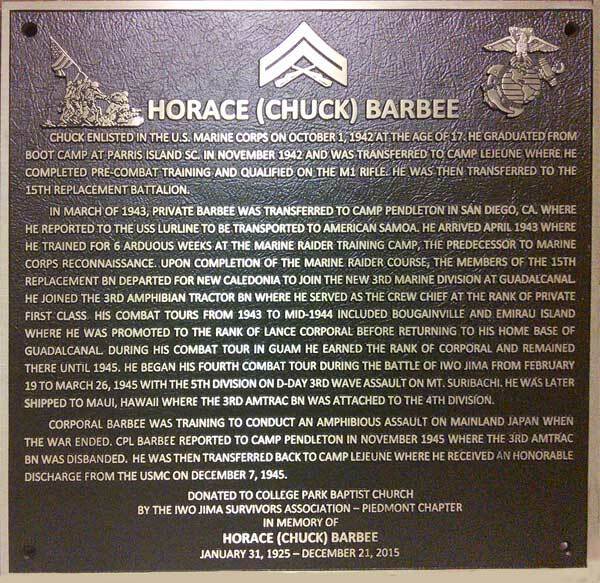 The association was founded by Horace (Chuck) Barbee, a U.S. Marine Corporal, who with the 5th Marine Division, was an amtrac crew chief during the 3rd wave assault on Mt. Surabachi on D-day February 19, 1945. Over the years, the association has gained additional members through veterans who share in keeping these memories and sacrifices alive. Since its founding in 1995, all but one of the association's original members have passed away. Samuel Prestigiacomo, now residing in California, is the last member of the original nine Iwo Jima Survivors of our association. Born in Dolgeville, NY He enlisted in the Marine Corps in Syracuse NY in 1943. He was assigned to 1st battalion, 26 regiment, C company, 5th Marine Division. He went ashore on Iwo Jima, February 19th, 1945, and was wounded in action on Feb 28th taking hill 362. The present group of associate members wish to continue the legacy established by Chuck to inform our community, support our veterans, and remember the sacrifices of our military. If you would like to receive more information about us or you are interested in joining with us in the support of all veterans, please send us an email. We will get back to you as soon as possible. While we meet for lunch on the second Tuesday of each month, The annual February luncheon on the anniversary of the D-Day invasion of Iwo Jima is the highlight for our group. 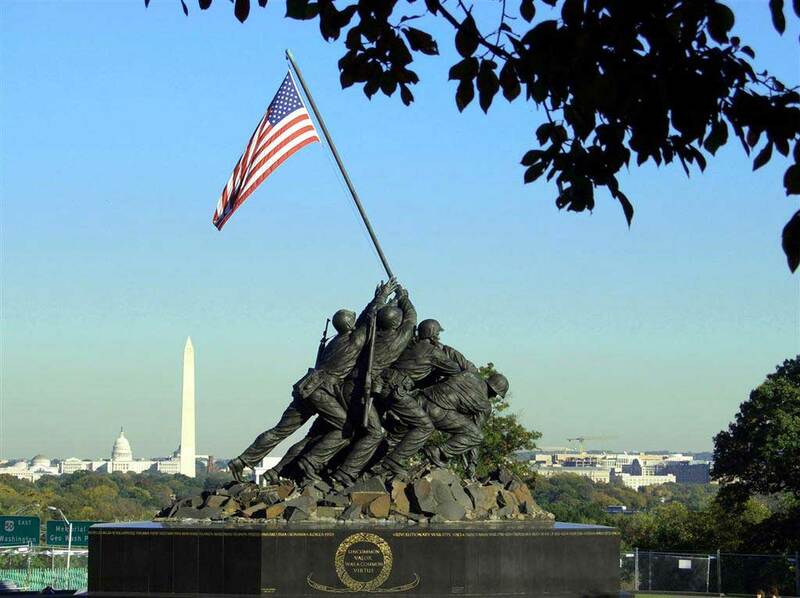 Iwo Jima Survivors Association is a non-profit 501(C)(3) organization. Donations can be made by sending us an email and we will then advise you of our mailing address. We mail out tax receipts for all donations during January following the tax year in which they were given. Major Melanie R. Slattery, USAF Operations Officer AFROTC Detachment 605 NC A&T State University graciously invited our Iwo Jima Survivors Association members to speak with A&T State University cadets on November 8, 2018. Click here for a photo review of that event. The Carolina Field of Honor, Triad Park is a joint venture of Forsyth and Guilford Counties. It is the culmination of efforts of Mr. William (Bill) Moss, A Marine Corps veteran, Founder of the War Memorial Foundation, and is a place of remembrance and honor which will be a permanent reminder of the sacrifice of service members. There are yet living and walking among us, every day heroes from Iwo-Jima, Saipan, Guadalcanal, Okinawa, Midway, the Philippines, Europe, Germany, Korea, Vietnam, Kosovo, Somalia, Desert Storm, Afghanistan, Iraq and many other expeditionary missions and peacetime assignments. We cannot afford to forget the price of freedom and those who have paid the price.